The last few days dealing with surly clients were fraught with high drama and the gnashing of teeth but fortuitously, offered up this week’s Two Cents Tuesday Challenge! Daily life, whether technicolour, monochrome or gray-scale can be, at best, give and take. How we deal with it relies solely on how we react – with logic or emotion, fact or fancy, nature or nurture. This week’s topic – Compromise – can be found in all the spheres that intersect: human, animal, plant, even things inanimate. It is sometimes as simple as our summer garden where the neighbour’s zucchini plant wound its tendrils along a shared fence and down into our tomatoes – the compromise rested between plant and static architecture, between friends’ understanding that sometimes nature needs to seek its own way rather than bend to our will. 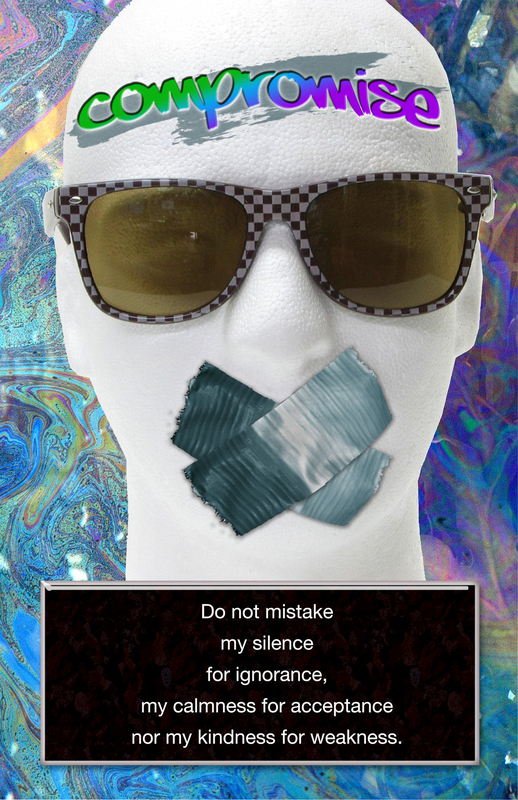 don’t mistake my silence for ignorance – you’ve created a very interesting challenge! Truly this picture is worth a thousand words! Unfortunately I can’t take credit for it but I do remind people of it when I’m cranky!